Macaroni is ever favorite food for young and old side by side, it is equally tempting to all of us. I remember the time, when I was a child, me and my sibling loved to eat macaroni, and to fulfill our hunger of this yummiest food my mother liked to cook it in bulk for us; simply made with minced meat and few veggies especially potatoes and green peas, - potatoes, peas and mince with soft warm macaroni topped with ketchup, giving a tasteful yummiest texture to the mouth - that was the best treat at that time on weekends. Even after having full day meal of it, we still wanted that for next day, well those were childhood tactics to have desirable food for at least two days. But now, often we are left with last platter of it in fridge, that of no use except to eat it the same way again. Few day back, it was a mirror day of old days, in the evening my amma jaan - I like to call Amma Jaan to my mother - went for some shopping. She got late, so I though to cook something for whole family and honestly, I was feeling hungry also. I just went to fridge and started exploring it – don’t be strange, its my funny hobby, to explore fridge for edible whenever I feel butterflies in my stomach no matter for what reason... lol :D – well the only good cooked thing I found was MACARONI… yeaaayy.. but that was too little for whole family. I again stumbled upon that cool place and found a tin of cheese - Kraft cheddar and mozzarella cheese bar we brought from Saudi Arabia - it was like to find a treasure on earth. I hurriedly went to kitchen and started brain storming, “what can be the best use of this leftover with just little bit effort” suddenly my mind hit an idea "Mac Cheese balls..!! ….yes, yes that can be made from it easily, I had saw that on web, that’s a new fast food introduced by junk food outlets" then I cooked mac cheese balls with leftover macaroni with quite variation to mac cheese nuggets available in market , and served those with French fries to my family, everyone appreciated that specially my mother who didn’t had to cook dinner after coming back home. 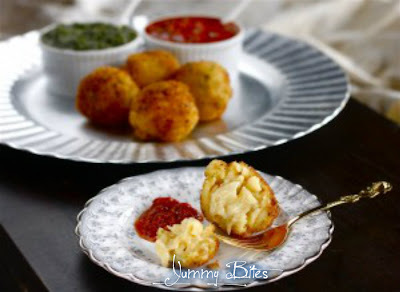 -Mix all ingredients in the list “For Mac Balls” in left over macaroni. -Mix well, that the macaroni binds because of boiled potato. -Make small balls of the mixture and set aside. -Meanwhile, mix egg white, white floor together, add water as required to make a flowing paste to coat the mac balls. -Now pick mac balls coat it in batter then coat with breadcrumbs, and place them in clean plate. -Fry a batch of 5-6 mac balls at one time. -Fry till the outer coating is transformed in to crispy brown cover. -Serve hot with Yogurt dip, Ketchup or Garlic sauce. For better test, the left over macaroni should be cooked in meat and veggies. Add pinch of black pepper to the breadcrumbs for more taste full covering. Yummy History of DoughNut "Donut"